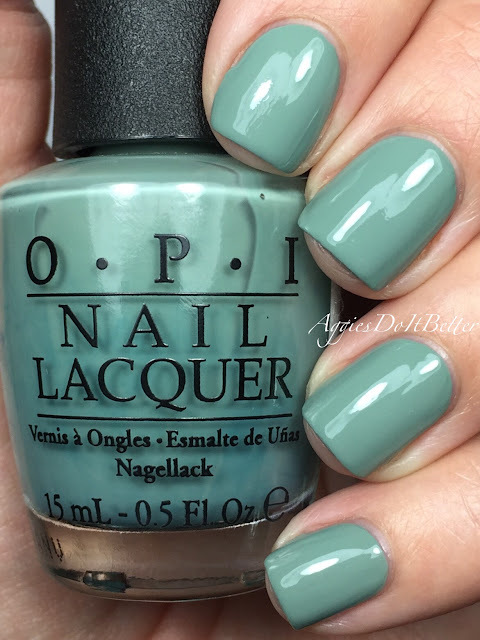 Aggies Do It Better: Untried Green OPI spam for St. Patrick's Day! I thought I'd go through the greens and pull out any that don't have my little stickers on the caps. I'm pretty sure I've worn at least one of these, but it was before I started cataloging them here so they aren't marked. Enjoy! Stranger Tides is from the Pirates of the Caribbean collection from Spring 2011. I picked this up at a Publix in my town. How do I even remember that?? The formula isn't great, it was thin and watery and pooled in my cuticles. Boo! I do like the color more than I thought I would, its a grayish green. This is 3 coats plus topcoat. 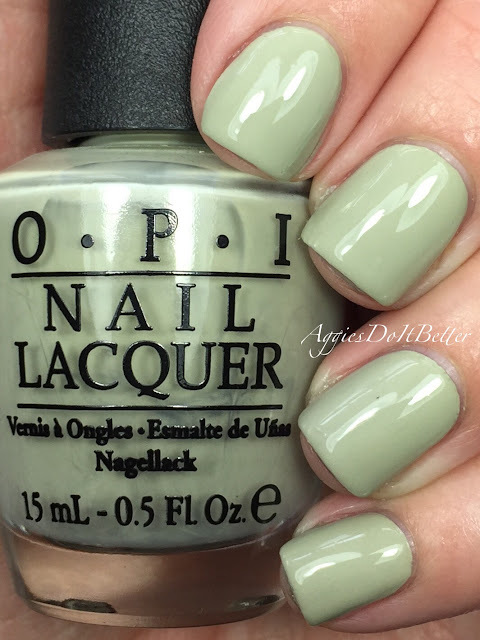 I feel like this isn't a great swatch because I had so much trouble with the formula, so sorry about that. Uh-Oh Roll Down the Window (giggle!) is from the Touring America collection for fall 2011. I guess it's supposed to be a vomit-green? 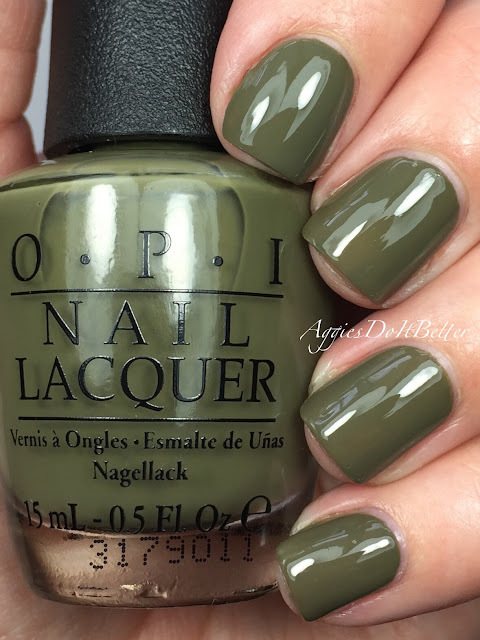 It's a really pretty army green, very appropriate for fall. The formula was pretty thin but I still managed to get away with 2 coats plus topcoat. Thanks a Windmillion is from the Spring 2012 Holland collection. I remember really wanting this one! The formula was PERFECT. Almost a one coater! I did 2 but it barely needed it. If you see this around anywhere be sure to pick it up! S-ageless Beauty is a new purchase, I saw it at Sally a few weeks ago and since it was 75% off and I don't have any of the Infinite Shine (no light gel hybrid) polishes I thought I'd give it a go. I definitely had to use a light hand, this is 3 coats plus regular topcoat. 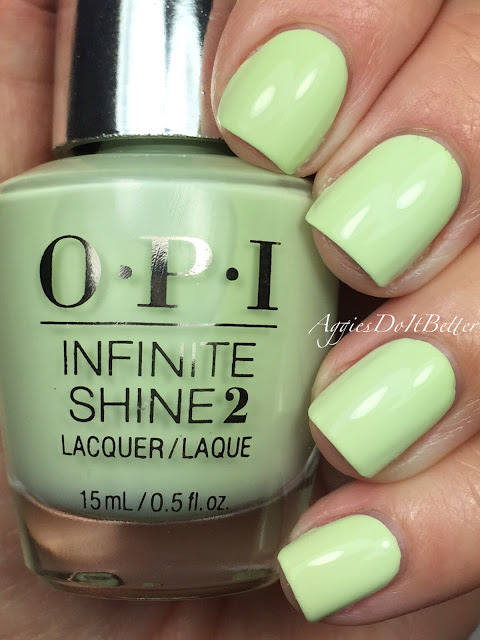 The formula wasn't that great, but maybe it's better over the Infinite Shine basecoat? I went really heavy with my 3rd coat and called it quits after that.